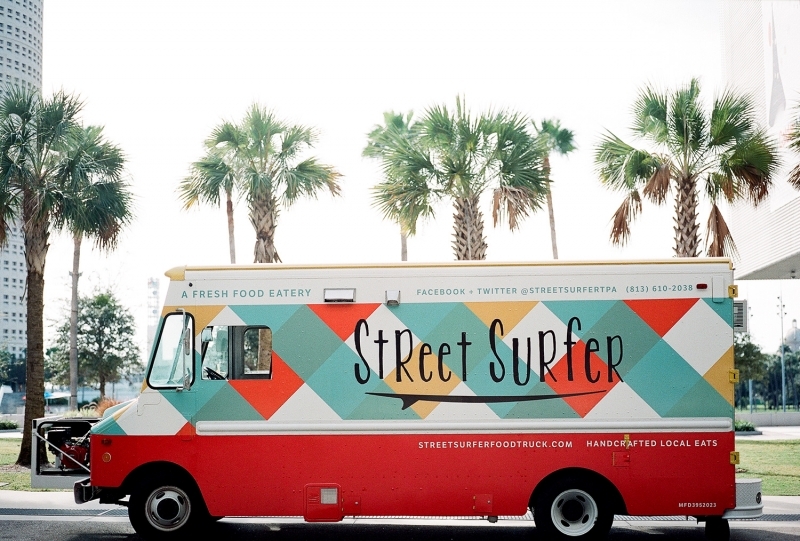 We had the chance to catch up with Cassandra over at Street Surfer for a food truck spotlight this week where she talks about food truck branding and design, running a food truck business, and shares some quick insight that might inspire your truck's big debut. We knew we wanted a fun, coastal, beachy theme. We had visited Hawaii a number of times and got to thinking about a surf themed truck. We played with a bunch of different names. A lot were focused on one type of cuisine or seafood, and we didn’t want to get that specific because we wanted the freedom to change our menu based on local/seasonal offerings. This was one that I had randomly come up with and texted Jake about. He loved it and I was still up in the air even after we started the design process. 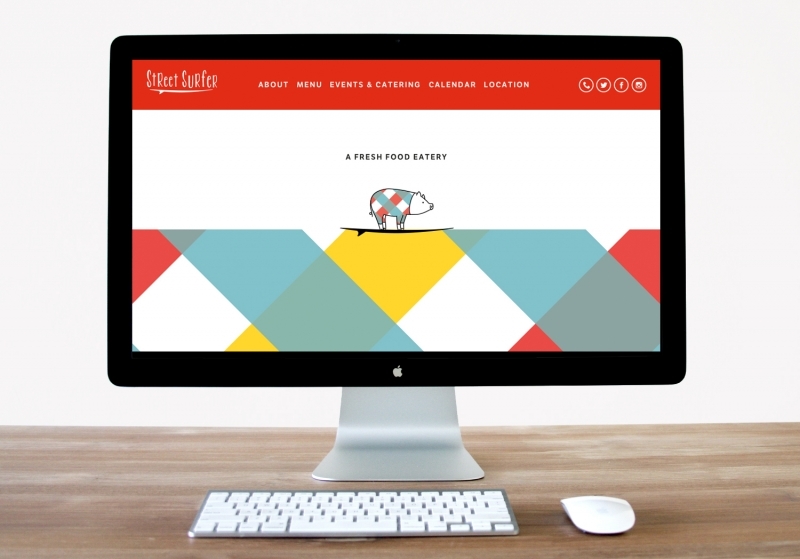 From there, Design Womb (Nicole) really focused and pushed the design and brand. We are still working to reinforce the brand within the small details/finishing touches. This is one of the things that gets put on the back burner when you are booked with events and focused on serving great food. But it’s something that you (as an owner) notice and really want to finish to complete your vision. Fun, fresh, and handcrafted local eats and bikini killer sweets. Since we own a catering company, Tastes of Tampa Bay, and believe in freshly prepared food, we knew we needed a mobile kitchen for those events that didn’t have an onsite kitchen. We used the truck for about a year before deciding to brand it so we could do food truck events as well. The website helps expose people to sample menus and the brand. I think social media is huge but people are still not necessarily visiting pages or interacting. Getting them to ‘participate’ is a challenge. Balancing our core business, catering, with wanting to participate more in the food truck scene. We have to be very selective on the events we commit to. Also, the atmosphere throughout the community is not always welcoming. That people are genuinely surprised at our price point, portion size and deliciousness. There are a lot of bad trucks out there gouging and serving bad food. Honestly, we kind of went in blind since our initial intention was not to have a food truck. However, after deciding that was the direction we were heading, we read a few books and researched the scene in Tampa before deciding on the theme and menu staples. Much like the restaurant industry, this is not an industry for those who don’t know ‘food.’ So many people are flocking to the food truck industry (including promotors) thinking it would be ‘fun and easy’ and they’re going to ’try this out.' If you have never worked in food you are in for a rude awakening. Between booking events, managing social media and your website and then staffing, shopping, prepping and maintaining your truck (yes, something always goes wrong or breaks), hoping the weather holds out, etc. The actual event is the easiest part of the entire process. Not only is Tampa saturated with food trucks, more joining the scene everyday, it is saturated with bad food trucks and those who don’t have a clue to what they are doing and are trying to latch on to those who do. This is what propels the roach coach mentality of food trucks. As a consumer, do your research and don’t support those who are not putting in the effort to source and actually create and cook their offerings (i.e. going to a restaurant supply store and buying pre made food). Food truckers, take pride in what you do and what you’re putting out. The pineapple relish! You can put it on so much and it compliments and garnishes a lot of our dishes. We had one employee who put it on ice cream. Seeing your vision come to life. If I could afford it, I’d put them on retainer for all my projects.